If you’re looking for something with a distinctly contemporary European edge, then award winning Freespace Design is an interior/architectural design consultancy specializing primarily in contemporary, custom residential and commercial design that may help you along the path to the creation of a unique experience for your home or business. Synergy: We believe the design process must be a partnership between the client and the designer. For any design to be a success, it is essential that there is clear and honest communication. To achieve this synergy, we are committed to taking time to listen so that the final design meets or even surpasses our client’s needs and expectations. Environment: As sustainability becomes an increasingly vital component in bringing harmony between lifestyle and the environment it is intrinsic to any design process, and every opportunity is taken to balance the needs of the client with the mutual desire to work towards eco-friendly design solutions. Recycling and reuse of materials is a feature of many of our interior schemes, in both residential and commercial applications. Color: Mere color, unspoiled by meaning and unallied with definite form, can speak to the soul in a thousand ways. – Oscar Wilde. With a European sensibility, bold use of color is a very important element in any design. Color consultation, selection and how to use color, researched and tailored to each individual project is a specialty. Fine Art: Freespace also offers insight and access to the world of fine art and is working towards the interface between community and the numerous local arts and craft practitioners. The Designer: In the belief that design is a holistic and interactive process, the objective is to develop strong concepts that bind ideas together to create innovative solutions. 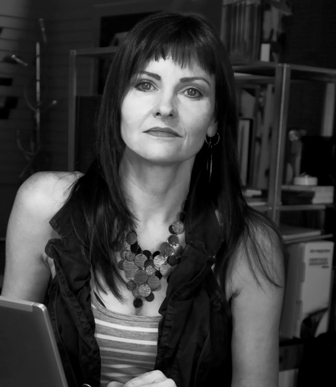 Owner/designer Geri Cruickshank Eaker, originally from Edinburgh, Scotland is a highly self-motivated, multi-disciplinary designer with over 25 years of work experience in design, photography and academia in the UK, Japan, Russia, South Africa and the US. Also a fine art painter, her work across all disciplines is concept driven and inspired by the excitement of the creative process and a passion for contemporary architecture, design, abstract art, Nature and life. Her work is distinctly contemporary with an unerring attention to detail influenced in part by her time spent in Japan during an internship with Takao Endo Architects in Osaka. A diverse range of experiences, including work on a low cost sheltered housing project on a township in Kwazulu, Natal, SA, raised her awareness and led to a better understanding of the needs of people based on circumstance and necessity. Education – Geri Cruickshank Eaker: Received both her Bachelor of Design Honors First Class, and her Masters degree in Interior & Environmental Design from Duncan of Jordanstone College of Art & Design, University of Dundee, Scotland, UK, where she subsequently taught before taking up an academic/research position at the University of Abertay where she was involved in the development of their first Computer Arts Degree course. She also holds an Advanced Diploma in Photography from Napier University, Edinburgh.